We can remove the toughest stains. Quality upholstered furniture is expensive – too expensive to be replacing or having reupholstered due to unsightly stains or wear and tear. 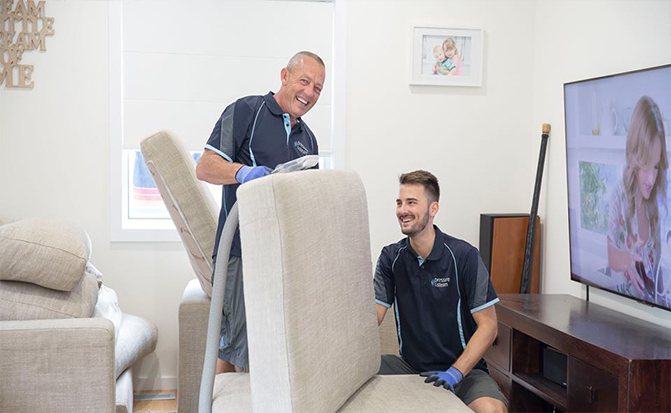 We are the upholstery cleaning company in Sydney that travels to your door to clean and protect the upholstery in your home, office or commercial premises. For upholstery that has been neglected or stained our couch steam cleaning services can remove the toughest stains. Once you’ve had the stain removed our upholstery protection service can keep your upholstered furniture looking immaculate for years. We train our professional sofa upholstery cleaners to perform our unique and permanent Microseal treatment to protect your home and office upholstery against the sun, stains and general wear and tear. All of our treatments are safe for the environment and safe for your family, staff and pets and our services and treatments are versatile. In your home we can clean and protect: lounges, couches and sofas, chairs, carpets curtains and rugs. In your office or commercial premises we can protect your entire fit-out: lounges, couches and sofas, screens, carpets, chairs, curtains and anything else with fabric or upholstery. We’re careful, reliable and we won’t let you down with poor communication. And don’t forget we come to you – upholstery cleaning in Sydney and suburbs. If you book us to have your couch professionally cleaned, we can follow this with an additional fabric protection service. This is an extremely quick service; a couch can take only 15 minutes (depending on the amount of fabric to be protected). It’s important to take care of your furniture properly after application and we’ll let you know how. Our professionally trained team are experienced in working with all types of upholstery. The head technician working on each upholstery cleaning job has completed vocational training at ITI.